If I didn’t make a half-hearted attempt at controlling the situation, my backyard would be nothing more than a huge raspberry patch. I can hardly keep up with eating them (and this is coming from a girl who knows how to eat a lot of berries!). I’ve been eating them by the handful and the bowlful, scattered over yogurt, baked into cobblers. I’m starting to wonder if I could just fill my purse with them and start using them as currency. Until then, we’ll settle on baking a simple cake. 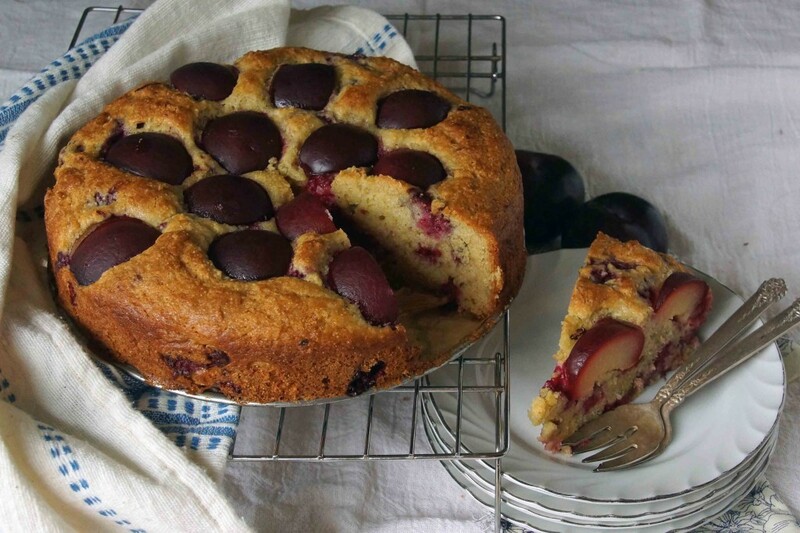 It’s a yogurt and olive oil cake that’s packed with raspberries and bejeweled with plums. It’s guiltless enough for breakfast or, with a scoop of ice cream, pretty enough for dessert. Since I have to spend some serious time picking all those raspberries off the bushes, I took a very quick route with the cake. 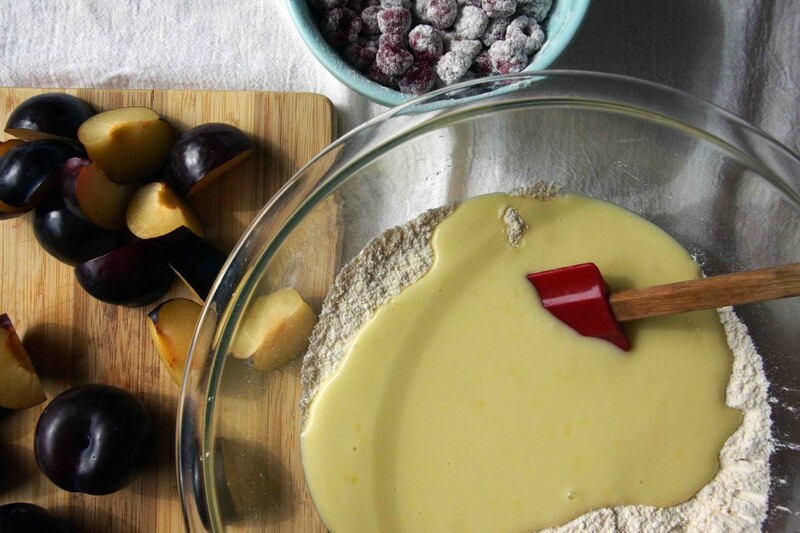 The batter can be put together in minutes, no fancy kitchen equipment required. You don’t even have to worry about letting butter soften because we’re using olive oil. Just grab a couple of bowls and get going! then quickly combine the wet and dry ingredients. Fold in the berries and spread into a springform pan. 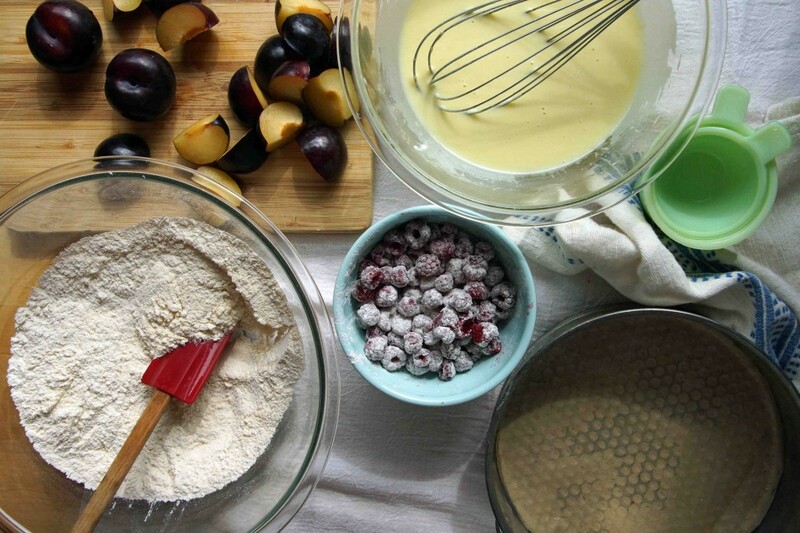 Arrange the plums in the batter so their pretty purple skin is facing up. Pop it in the oven and go about your business for a bit. Pull the cake out of the oven and let it cool before you slice into it. Patience is a virtue. Patience is a virtue. Too many raspberries? Never! 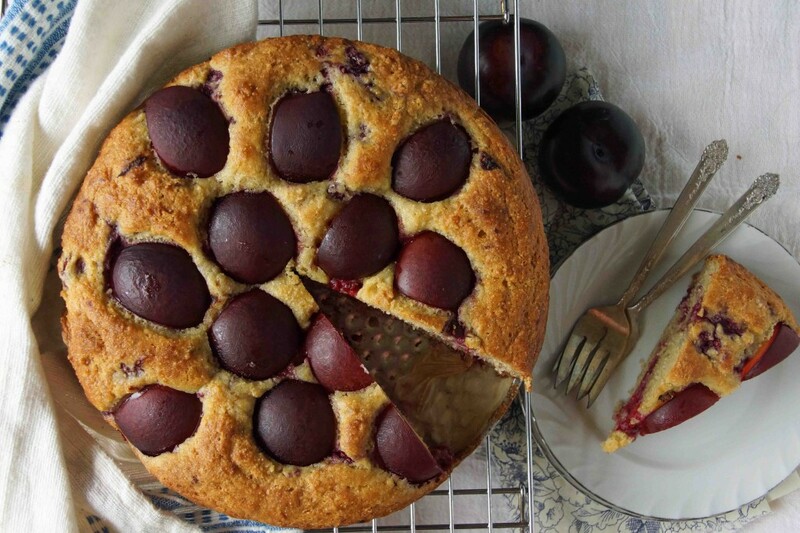 Cut yourself a hefty slice and enjoy summer’s bounty while it’s here. 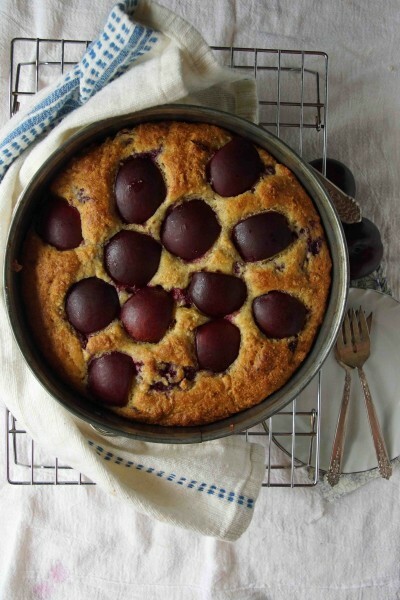 This lightly sweet, fruit-packed yogurt-olive oil cake is great with your morning coffee or served with a scoop of ice cream and a few additional berries for dessert. Preheat oven to 350°. Line the bottom of a springform pan with parchment and oil the sides. In a large bowl, whisk together 1½ c. flour, cornmeal, salt, cinnamon, baking powder, and baking soda. 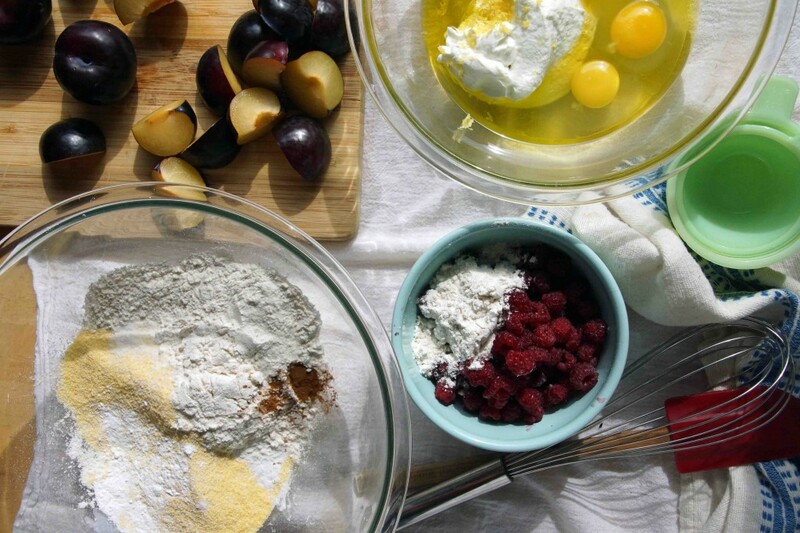 In a medium bowl, whisk together yogurt, oil, eggs, sugar, and lemon zest. 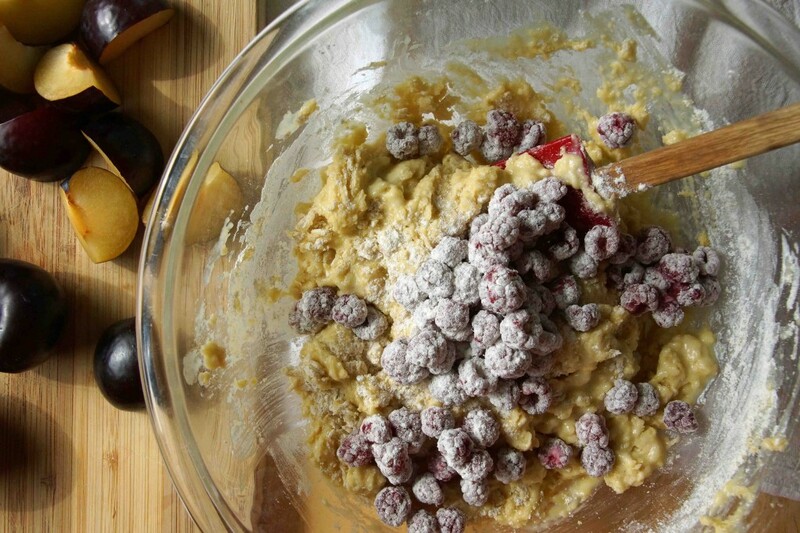 In a small bowl, toss the raspberries with the remaining 2 Tbsp. of flour. Pour the wet ingredients into the dry ingredients and quickly combine until just combined. Gently fold in the raspberries in 2 additions. Transfer the batter to the prepared pan and spread evenly. 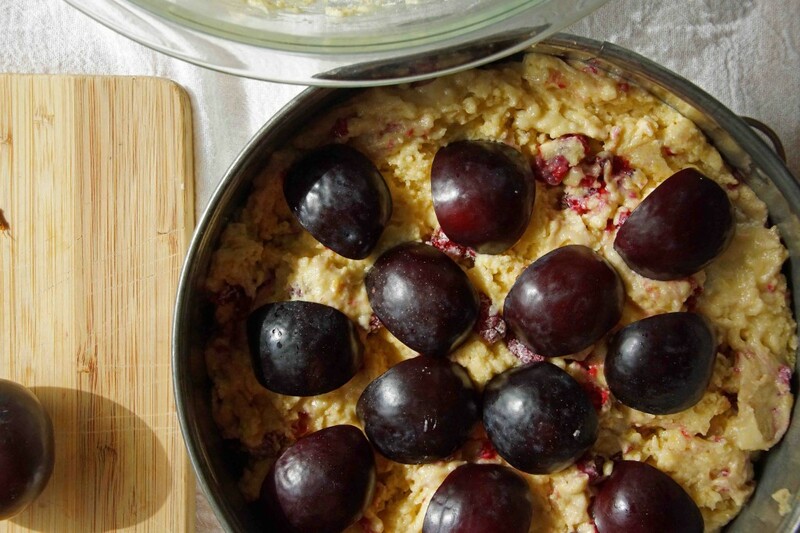 Arrange the quartered plums in the batter, skin-side up. Bake until a tester inserted in the center of the cake comes out clean, about 55 minutes. Cool on a rack for at least 15 minutes before slicing and serving. Question: Do you think this cake can be made and frozen before use? I got all the ingredients to make this weekend to take to a wine country house party, then didn’t but want to serve it on Thursday (four days). If I made it today and froze it in the springform covered with foil, how do you think it would be? Thanks. I would take it out of the pan, wrap it very well with plastic, then wrap with foil before freezing and I think it’ll work out just fine. Good luck! That sounds delicious, glad it worked out! 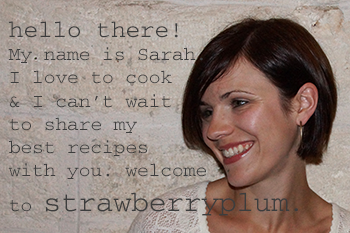 i love plums, but have never had them any way but raw. this is a beautiful cake, and it looks like it would be excellent served at tea!